Much as I love experimenting in my kitchen and try to avoid serving the same thing twice to my dinner guests, I am on a staple diet where lunch (Monday to Friday) is concerned. Among several other food-addictions, I am absolutely addicted to rucola, or rocket salad. 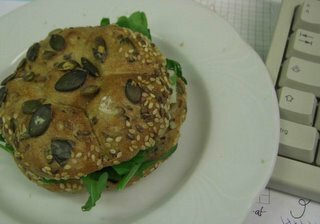 Every day, I bring a sandwich into work which closely resembles the one on the photo and consists of a (usually pumpkin seed) roll with a bit of butter, a generous layer of rucola, cheese (at the moment I'm in my pecorino dolce phase) and occasionally also prosciutto. I really look forward to eating it every day. I don't make my own sandwiches in order to save money (you should know me better by now!) but because most shop-bought ones a) only contain one or two token leaves of rocket if at all and b) always have some nasty ingredient which I don't like and would have to remove. Needless to say, it doesn't really make sense to pay for stuff have of which you bin. I also don't mind spending 5 minutes on sandwich-preparation in the morning at all as I'd probably have to spend twice the amount of time queuing for a mediocre ready-made sandwich. By the way, I don't waste my 75-minute lunch-break on the mundane task of eating but use it for shopping or important errands instead, eating at my desk after the lunch-break proper is over. Working in the city center does have certain advantages as does sitting in a room which is not on the same floor as your boss's. I only interrupt my rucola-diet when I've either run out of the main ingredient (i.e. don't want to buy the limp pre-rinsed leaves the supermarkets have to offer) or have arranged to meet someone for an actual lunch-date which involves eating at a restaurant. Lunch-break purchases: I picked up the Christmas cards with my photos that I had ordered last week and am very pleased indeed both with the result and the price (€11,60 for 40 cards with envelopes!). Further acquisitions: 2 pairs of guest slippers and chocolate. Great bargain - where was that? Bipa? No, it was COSMOS actually but I'm afraid the special offer for 29,9 cents/card with envelope is over now. I don't know what the regular price is, but the quality is very good and the "decoration" (i.e. the "Merry Christmas" template) bearable. Thanks for the compliment (yessss, bring them on!). You know what, I'm very familiar with your blog, too (which I discovered a while ago also via the "Glory of Carniola") and you can count me among your regulars. So: compliment returned! He, he, guess that makes us card carrying members of the Mutual Adoration Society. Loves it! Michael, I appreciate that you cause new friendships here. Could you now please divert rich bachelors to my blog? Thanx forever. Yes, Michael do send the rich bachelors Novala's way and while you're at it get them to send ME just their money without themselves attached to it. Wittgenstein has a point Great bargain - where was that? Bipa? ~novala No, it was COSMOS actually but I'm afraid the special offer for 29,9 cents/card with envelope is over now. I don't know what the regular price is, but the quality is very good and the "decoration" (i.e. the "Merry Christmas" template) bearable. Thanks for the compliment (yessss, bring them on!). You know what, I'm very familiar with your blog, too (which I discovered a while ago also via the "Glory of Carniola") and you can count me among your regulars. So: compliment returned! He, he, guess that makes us card carrying members of the Mutual Adoration Society. Loves it! Michael, I appreciate that you cause new friendships here. Could you now please divert rich bachelors to my blog? Thanx forever. Novala Yes, Michael do send the rich bachelors Novala's way and while you're at it get them to send ME just their money without themselves attached to it. Single? Desperate? Move to Alston!